I am seriously considering officially titling one of my weekly fashion posts 'What I Wore Shopping', because on average, I only wear 'real' clothes twice a week: one day to go shopping, and the other day to go to church. The rest of the week I spend half the day in work out clothes, then the second half in my son's or husbands old clothes to work out in the garden during the warm months, or yoga pants and a sweatshirt in the winter. I should really take a selfie of me in my garden clothes…you probably wouldn't even recognize me covered in dirt, a head scarf, and men's clothing. Maybe I will. That would be quite an entertaining post. In the meantime, I have a bunch of shameless selfies to share with you of what I wear on those days when I'm just running errands. Since I am dressed grungy most of the week, I do like to take the time to pretty myself up when I do leave the house, even if it's just to the grocery store! The outfit I'm wearing below is a denim tunic with a striped tank underneath (both from Old Navy) and dark denim jeans. I wore a pretty shell type necklace to dress it up a bit more. It was one of those transitional spring days when I wore this outfit. The weather was getting warmer, but there was still a lot of 'slush and muck' on the ground, so I had to wear tall boots. I meet my husband for lunch every Friday. We have a monthly 'Adventure' date where we either take a day trip or go away for a weekend, but we also have a weekly lunch date. Some weeks, if my shopping/errands take too long, it turns into a supper date as well. Our lunches always have to be close to where my husband works so our choices our limited. 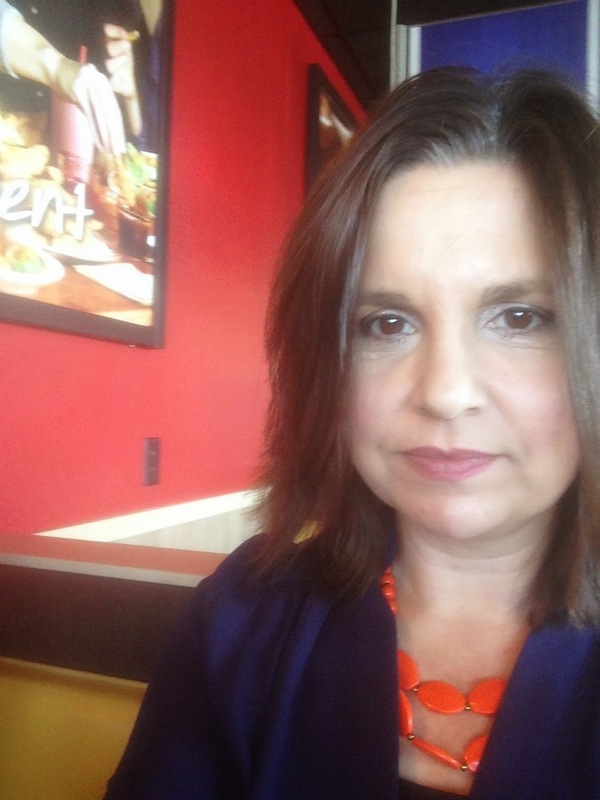 In the pictures below we were eating at Burger King….but we always have fun, no matter where we are. In the summer, I actually like to pick up lunch (then I can choose any restaurant) and we enjoy eating outside his office on picnic tables. On this date, I wore a simple blue tunic from Modcloth (you can see the full shirt HERE), dressed up with an orange beaded necklace. And here is my husband showing his enthusiasm at having his picture taken during lunch. He's just kidding. He doesn't own a cell phone and says he never will, but he lovingly pays for mine, because he knows I love my IPhone. On this day, I wore my same denim tunic (what can I say, I love my denim top) to have my hair done. I had just tried going back to a darker color after years of lightening it, and I really liked the result. It shows the greys faster, but I get my hair done every six weeks, so that helps. This outfit I just wore last week when believe it or not, it just snowed again! I got so many compliments on this outfit, I was perplexed. So many women commented on the boots. I wanted to wear flats that day, but because of the snow, I had to wear boots. I couldn't bear to put on my tall dark boots again, so I wore these cute little white booties from Francesca's instead. This outfit is actually very simple: a white tee shirt with light denim. But it was the shoes and accessories that seemed to catch every one's attention. 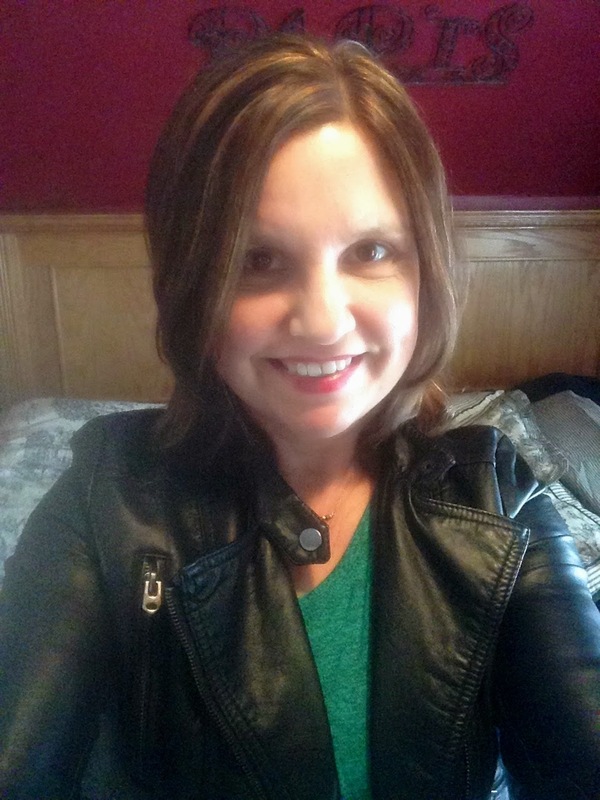 I wore a military jacket I received from Stitch Fix, and a pretty necklace from Express. 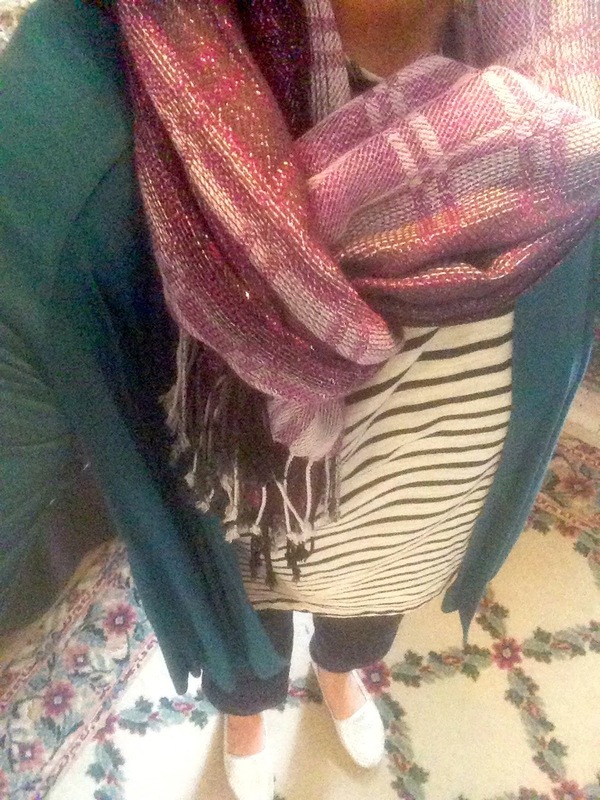 What I also did to even make the outfit even more appealing, was add a stripe gauze scarf and a cute boho handbag from Francesca's (you can see the bag HERE in another post). Unfortunately, since I grabbed these two items as I was headed out the door, I never got a picture of me in the completed ensemble. The scarf was actually an afterthought because I was worried I would get too cold without one, and I always forget to take a picture of my handbag…so that's normal for me. The attention this outfit received that day was an example to me of how you don't need to spend a lot of money on clothes to look good. It was just a simple white tee and jeans, but when you add newer, trendy accessories: like jewelry, scarves, purses, and a pair of cute shoes….you have a really neat outfit. If your going to spend money on anything, it should always be your shoes. I use to have such a hard time spending money on shoes when I was younger, but now I realize that's where the majority of my clothing budget money should go. The right shoe really completes the outfit, and unlike clothes, you don't 'outgrow' your shoes. If they go out of style, just save them! I guarantee you they will come back into style again, and if they don't, well then they are vintage and that's always in style! On another shopping day, the snow was actually gone again and I could wear flats. Yeah! I love all my cute little flats. The pair I have on are a pretty metallic silver. 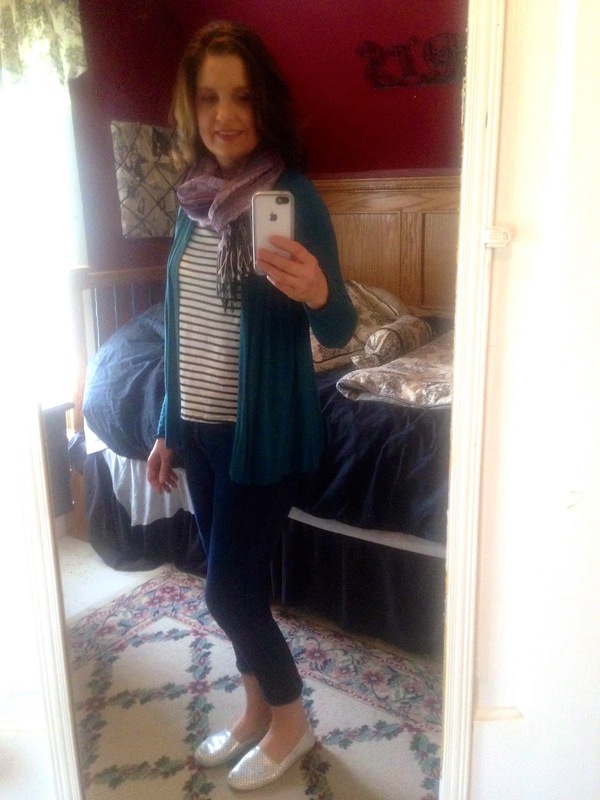 It was still a bit nippy on this day, so I wore a striped shirt and clove colored cardigan (both from Stitch Fix) with a purple scarf and jeans. I keep seeing these selfies taken from above all over the Internet, so I have been trying them myself, but I must admit, I just can't do it as well as everyone else does. I did keep this picture however, because it shows the pretty detail and sparkles in my scarf. This is what I wore when I had my hair done, again. (When your my age, you become best friends with your hairdresser…what can I say?). This time, I had my highlights put back in. I usually get highlights for the warmer months, and stop highlighting in the fall/winter. 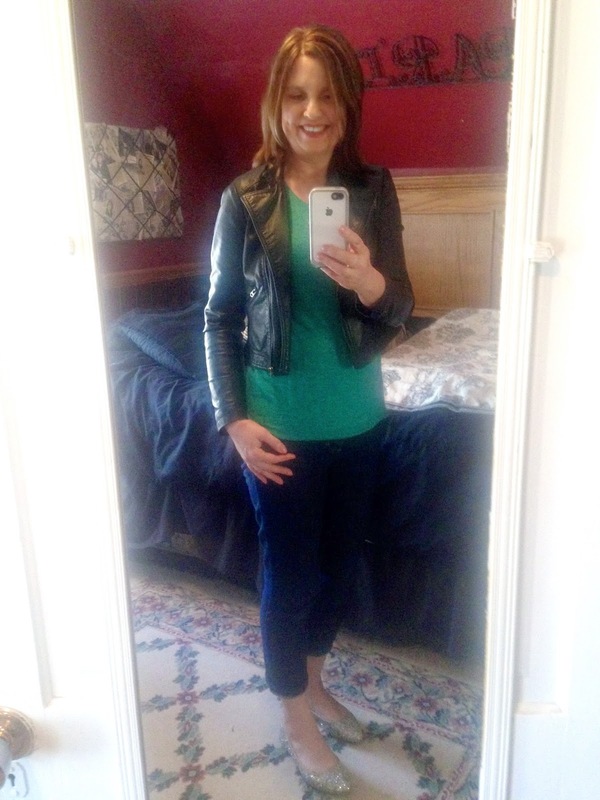 I'm wearing a green tee shirt I received in my latest Stitch Fix, a black moto jacket (old, from Forever 21), jeans, and gold shoes from Old Navy. 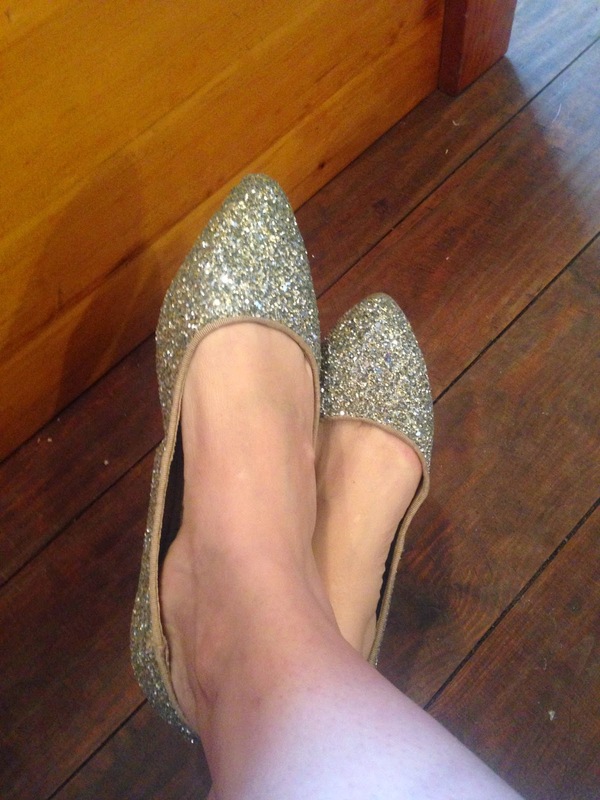 Yes, you heard me right, sparkly gold shoes…a girl has to dress like a princess sometimes. Here's a picture showing off my new highlights. I really love how fresh new highlights make you look. And that's it ladies…that is what I wear shopping. Usually just jeans with a pair of cute shoes/boots and lots of fun accessories! So what about you? What do you wear shopping? Do you put much thought into your attire when your just headed out of the house to run a few errands, or do you just wear whatever you had on in your home? I'd love to hear from you! Linking Up with: Casual Friday, Let it Shine, A Little Bit of Cheer, and Fashion Should Be Fun. I really like how you layered your denim tunic over your striped top - too cute! I also have a difficult time taking an over the top selfie - I think longer arms would help!